I’m just going to come out and say it. Fair Game is one of the best political drama-thriller I’ve seen in a long time. And no, I’m not talking about the Cindy Crawford, Billy Baldwin classic of 1995. 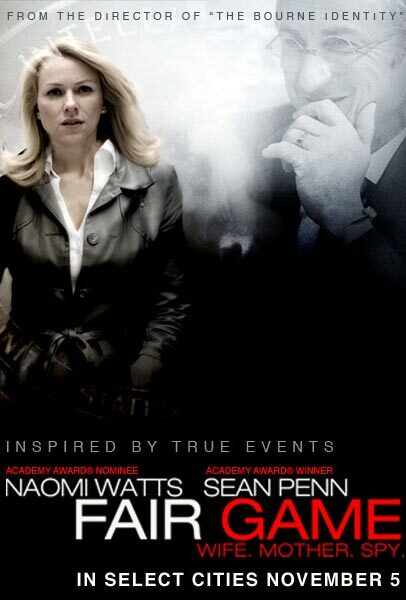 This Fair Game stars Naomi Watts and Sean Penn, and tells the amazing true story of Valerie Plame, a former CIA operative, and her husband, former US ambassador Joe Wilson. Admittedly, as a non-American, I knew very little about Plame’s story when I went to the screening, and I made a conscious effort to steer clear of any spoilers. So I’m going to try and not give anything away here, except to say that Plame worked as a CIA operative and the story is set around the time the US made the decision to invade Iraq based on faulty WMD intelligence. Both Plame and Wilson played roles in that intelligence gathering process. Directed by Doug Liman (best known for The Bourne Identity and Mr & Mrs Smith), Fair Game is carried by its riveting plot and dynamite performances from Watts and Penn, who should both be in the running for Oscar nominations. It provides a fascinating insight into how the US manipulated the intelligence to skew their decision towards war, and the devastating impact on the lives of those who tried to unveil the truth. At its heart, Fair Game is about the relationship between husband and wife, and the strain their jobs and beliefs puts on it. Watts and Penn’s performances more than make up for any deficiencies in the script, bringing Plame and Wilson to life. This was so important because the film would fall apart if the audience doesn’t care about the characters and what happens to them. On the other hand, Fair Game is far more than a domestic drama. There is tension all throughout the 106-minute running time (very suitable length for a movie of this kind) — from Plame’s dangerous operations in the field to even just a seemingly friendly dinner party. There are no slow bits. Of course, there are people out there who will already know a great deal about “The Plame Affair”, and have their opinions of the couple. And if that opinion is negative, then they will probably hate this film, because it does come across as a little self-righteous. It is, after all, based on books written by Plame and Wilson, so we effectively only get their side of the story. I also read in the press materials that because of “national security” reasons, the filmmakers had to sidestep certain things and fictionalise certain aspects of the film, such as particular situations or characters by depicting something or someone “similar” as opposed to the real thing. So yes, the “true story” part needs to be taken with a grain of salt. But to me, Fair Game is just a great story, fabulously told and wonderfully acted.